Admittedly, the Rev’d Wena Parry’s mobile insignia is not of the same order of subtlety as your average ‘Jesus ♥ You’ bumper sticker. But who is to judge? If religious logos and personalised branding now constitute modifications which must be declared to an insurer, has Jesus become turbo-charged? Does soteriology compare to transmission modification? Is the gospel to be equated with revved-up exhaust improvements, alloy wheels or bespoke spoilers? Apparently, the Rev’d Wena had tried to make a claim after “a part was stolen”. We are not told which part, but presumably these modifications did not render her car at greater risk of accident or greater risk of theft, which are the usual sorts of modifications that insurers insist (quite reasonably) must be disclosed. Indeed, such a bold profession of faith might arguably decrease the risk of having an accident, for (by faith) her guardian angel might watch over her a little more assiduously in order to facilitate her motorised gospel sandwich-board. If anything, her car has been manifestly devalued by this catechistic customisation, to the extent that no car thief would touch it with a slim-jim or a slide-hammer. Her premium ought, therefore, to be reduced. 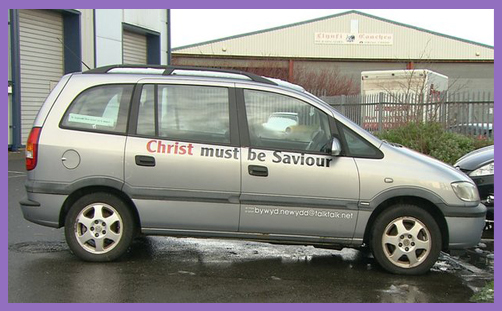 A sticker declaring ‘Christ For Me’ is a declaration of faith without monetary value: it is a cosmic sat-nav; not an in-car multimedia screen so beloved of boy racers. This, with respect, is a daft assertion. If the Rev’d Wena Parry lived in (say) Tower Hamlets or in any other proclaimed ‘Islamic zone’ where ‘sharia law’ operates, her car might very well become more prone to vandalism. But in Cymmer, Neath Port Talbot, Wales? Age UK must now urgently clarify what vehicle ‘modifications’ expressing personal/religious identity need to be disclosed in order to guarantee insurance validity. Must a Sikh driver declare a khanda pendant hanging from the interior mirror? Must a Muslim driver declare the presence of a ‘Bismillah Ta Arabisch‘ sticker or a hanging ‘Allah Swt’/’ayatul Surat Al-falaq‘? Must an LGBT driver declare a ‘Gay Pride Rights Rainbow Car Aerial Ball Antenna‘? Must the Conservative Party warn their members that displaying a ‘Honk for Change‘ car sticker might invalidate their insurance (especially in Liverpool, East Ham and Rhondda)? We look forward with great interest to the reading the reviewed wording on Age UK insurance policy applications.